Environmental analysis for a selected focal company in the automobile industry. This Assignment is based on an environmental analysis for a selected focal company in the automobile industry. The document has mainly assessed the external environment of the company using different strategic management evaluation tools and has also identified the dominant aspects of the internal environment as well. Therefore the main objectives of this assignment will be to analyze both internal environment and the external environment of Jaguar Motors-Which would be the focal company in this document. This has also made certain recommendations at the end of the document. Jaguar is a well-known luxury automobile brand under Jaguar Land Rover which is owned by Tata Motors since 2008. Jaguar Land rover is a multinational company which has located itself in Whitley, Coventry, England. Currently Jaguar produces cars belonging to different models such as F-Type, XE, XF, XJ, R model etc. Thus Jaguar is not a dominant brand in the Sri Lankan context, the document has focused mainly England and European context in analyzing the environment. Jaguar Land Rover which is a subsidiary of the Volkswagen, are in huge competition even in the European context. If you analyze the market statistics from 2014 to 2016 Jaguar has not being able to make a huge impact on the market in terms of the market share. 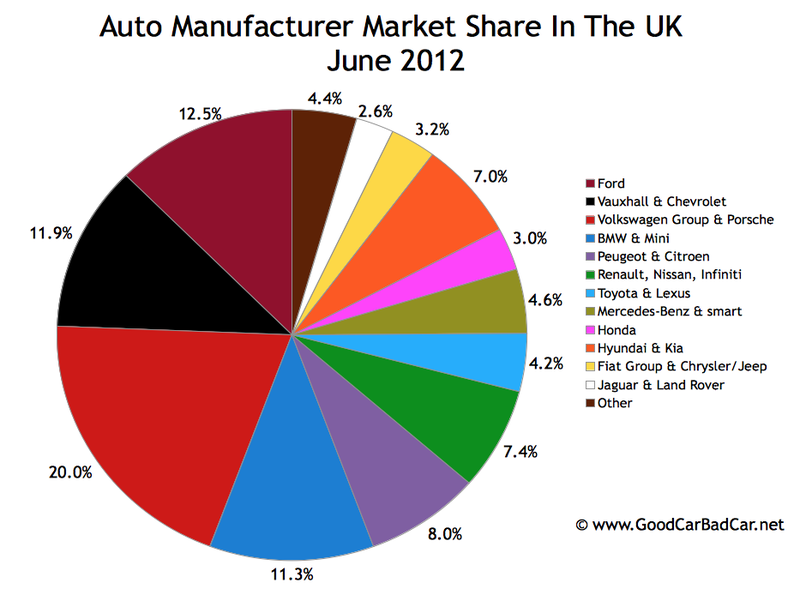 As depicted in the above graph, Jaguar is not maintaining a huge market share in the British market. The market share was less the even 1% during 2014. But in 2015, Jaguar reflects a considerable rise in the market share to above 1%. It records its highest market share in July 2015 with 1.35% market share in automobile industry in United Kingdom. Therefore it could be seen as an improvement in the market share of Jaguar cars in the European market especially after its change in ownership in 2008. The Automobile market in United Kingdom is a hugely competitive market with more than ten dominant operatives of well-known brands. Dominant brands such as Ford, Vauxhall & Chevrolet, Porsche, Volkswagen, BMW and mini, Peugeot, Renault Nissan, Toyota and Lexus, Benz, Honda, Hyundai, Fiat, Jaguar and Land rover etc. operate in United Kingdom with the greatest market presence. As given in the above diagram, in terms of the market share Jaguar Land rover holds the least out of the dominant list of brands. 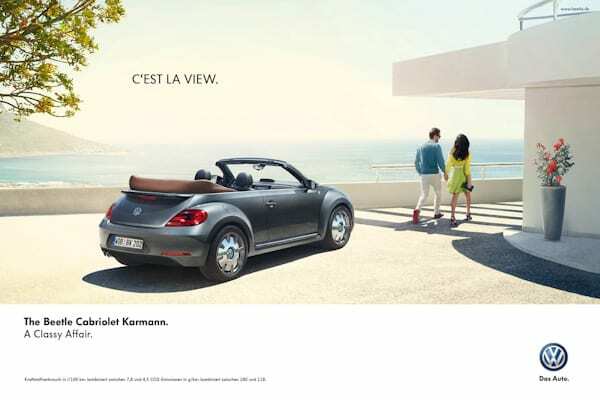 The leader in the English Automobile industry happens to be Volkswagen; as an independent brand. Therefore Jaguar does compete in a hugely competitive market together with its complementary brand Land rover. The above diagram presents the competitive position of Jaguar in United Kingdom and the value propositions of each manufacturer in competing in the industry. As depicted on the graph Jaguar has been positioned as a luxury brand which delivers high social status but relatively lower on the affordability aspect due to its luxuriousness as a brand. Therefore it is in direct competition with Brand such as Mercedes Benz Porsche and BMW in terms of certain models as well. Chevrolet is also another brand that is in competition with Jaguar in terms of performance as an evaluating measure. Therefore it should be noted that this graph represents the competitive position of Jaguar only in terms of Social status and Affordability. The competitive position might change if certain other evaluating criteria might have been used. Evaluation of the External Environment Based on the Five Forces Model. The intensity of competition governed by the rivalry among competing firms is determined by several factors, some of those which cause the intensity of competition to increase are given below. Demand in the industry declining forcing all players in the industry to share the saturating market. As given in the diagram the rivalry caused by the number of competitors in the industry in British automobile market is intensive. All the dominant world brands do operate in Britain causing huge competition. And especially in terms of brands offering similar products to Jaguar are also present in the market. In that context Jaguar is in competition with Mercedes Benz, Chevrolet, and BMW in terms of luxury class vehicles. Therefore the rivalry caused by the number of competitors in the market is high. This could also be considered as the foundation for the intensity created due to number of substitutes. As far as the luxury car market in United Kingdom is considered, a particular customer has the choice between a large number of leading brands. Therefore if Jaguar does not practice a competitive strategic techniques, it might fail as its similar competitive firms will attract their potential and existing customers. This also makes it easy for customers to switch brands easily. Another major factor causing the rivalry to increase is the mergers and acquisitions in the industry. As provided in the introduction section, Jaguar Land Rover merged with Tata motors India. This provided them with an extended source of resources with certain strategic advantages in competing in the automobile industry. According to the statistics given in the diagram about the market share in United Kingdom, it is obvious that the European Automobile industry is a hugely competitive firm. So as far as the market entry is considered, it is not difficult to enter the market with new brands. But the considerable issue is it would not be easy to survive in the market as only the most dominant brands with considerable history has been able to survive in the market. This is especially applicable to the quadrant in which Jaguar operates; Luxury and Expensive cars providing high social status. But as far as the Toyota’s entrance to European market is considered, Toyota entered with a different value proposition. And they practiced niche marketing strategy in developing their products. Toyota did not try to compete with classy products in the United Kingdom market. They only attempted to enter in to the affordable automobile market with considerably high quality products. They also introduced the brand Lexus to target western customers. Therefore the potential of new entrants to the industry is possible, but as far as luxury product market is considered; it would not be easy. But there is a potential for new entrants in terms of new brands occurring due to merges. The bargaining power of customers depends on several factors, the bargaining power of customers’ increases in the presence of following situations. Luxury automobile market is considerably smaller in size. Therefore the level of competition in the market is on the higher end. This provides a higher bargaining power to customers due to the lower level of demand in the market. And as highlighted throughout the document, customers can switch brands as all luxury brands provide the same value proposition. Therefore customers possess considerably higher bargaining power. In the automobile industry, this has not been a factor of great impact to competitiveness as all the automobile companies are in long terms agreements with their respective raw material suppliers. To a greater extent these manufacturers are practicing backward integration strategies to bring down the uncertainty levels in terms of raw material quality and availability. Therefore suppliers in this industry do not possess high levels of bargaining power. This in turn causes to reduce the level of competition in the industry in terms of price competitiveness. 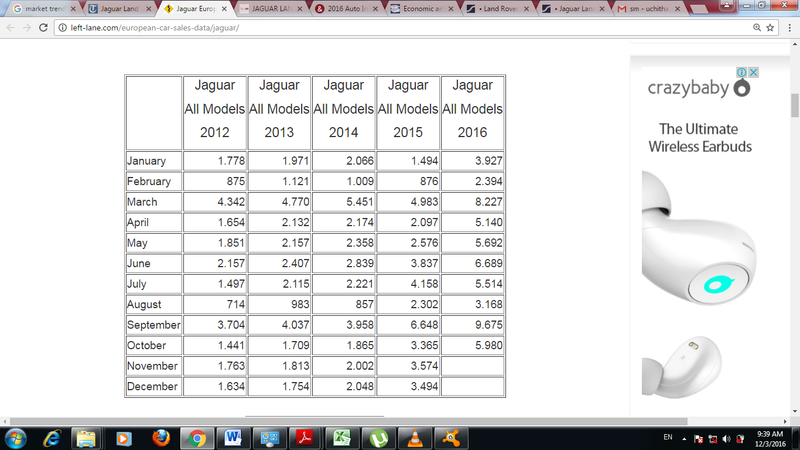 The above table was extracted from an article on a newspaper about Jaguar sales volumes since 2012. As it could be seen clearly the sales values of Jaguar is in the rising trend. This was mainly due to its latest brand introductions in terms of different models. Therefore Jaguar should maintain their persistent attempts in innovations. Emerging nations and Brands are another aspect that has to be considered by Jaguar. The emerging economies of Asia delivering high quality products to the market and the emergence of appealing brands from such economies have become a vital factor in world markets irrespective of the industry. Therefore this is applicable to automobile industry as well. The best example is Toyota. No one would have ever thought Toyota would be so successful in the western markets as a product from an Asian Country. But its positioning strategy and strategies did help them to become a substantially competitive brand in the European market. Performance improvements are again of critical importance. As the fuel prices fluctuate frequently, automobile manufacturers need to consistently improve the fuel performance of their vehicles. Especially after the introduction of the Hybrid vehicles customers are so concerned about the fuel consumption of vehicles. Therefore Jaguar should place an equal emphasis on the matter of performance as to the level of design and options. The focal company of this assignment was Jaguar Automobile Company. Document initially evaluated the competitive position of Jaguar in terms of Affordability and social status. In terms of affordability jaguar was placed well behind as it was an expensive luxury brand even in the European market. But in terms of Social status, jaguar was a very competitive brand. Therefore Jaguar was placed in the quadrant of high class less affordable/ expensive brand. Therefore their value proposition should reflect that too. In terms of Porter’s five forces model, Jaguar is in intense competition due to the availability of large number of operators in the English automobile market. The lack of entry barriers and the potential development of substitutes are other factors causing to enhance the level of competition in the market. But it was obvious that the supplier bargaining power was on the lower end and the customer bargaining power was on the higher end. In terms of trends, certain dominant trends can be seen. The rise in sales of Jaguar vehicles in the past years, the emergence of new economies and brands and the concern for high operating efficiency of automobiles by customers were some of them. The respective strategies to handle these situations were also discussed in the recommendations section. David, Fred R. 2011. Strategic Management: Concepts and Cases. 13th Ed. Prentice Hall, New Jersey: Pearson Education.